Fitness zone features side entry steps with full body recliner and sculpted massage seat, open barrier-free fitness area, two RX6™ standing massage columns. 36 hydrotherapy stainless Reflections Jets™ . Full body massage columns, reclining and sculpted seats with shoulder, upper and lower back, hips, calves and feet jetting. 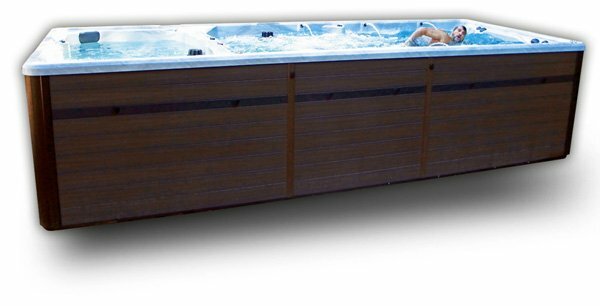 So many features in this space saving 15’ swim spa model. Full body hydrotherapy from 36 Reflection Jets™ in stainless finish, and 6 high powered Synergy Pro™ jets delivering just the right amount of water resistance for your aquatic fitness goals. Highlights Lighting™, 6 cascading water spouts, finished in a very vogue M Series™ cabinet and you have a swim spa others envy.